For years, we have proudly displayed a painting by a former client of GSH, the artist Lee Jaworek, in our office. Years ago, we helped to locate affordable housing for Lee; and in return for our help, Lee and his mother donated a copy of his “Sunflower” painting to GSH. 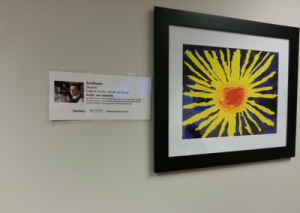 As a young artist with Autism, and calling his work “Artism,” Lee has successfully reflected his unique view of the world as seen “through the prismatic lens of Autism.” Recently, Lee was honored to have his “Sunflower” painting shown on a CBS SundayMorning program. You can read more about Lee on his personal website here. This week, while attending the Virginia Housing Day gathering at the State Capitol in Richmond, I happened on Lee’s “Sunflower” painting in a display of Virginia-based artists living with Autism. It was a pleasant surprise for me — and really heartening to see Lee’s progress and real artistic success.